The Student National Dental Association (SNDA) has been very busy the past week! Check out the photos sent in by Aquilla Sprewell (D17) from last week's Friday Night Supper and their Harvard St. Neighborhood Health Center Event. Colgate to Offer Free Toothbrushes and Products to TUSDM Student Organizations! Colgate Academic Relations is pleased to support TUSDM’s community outreach projects by providing student groups with an opportunity receive free Colgate products. Click here for details! If you wondered why it was so quiet on Friday afternoon, it's because ASDA scooped it up at it's ice scream social in the Jaharis Courtyard. 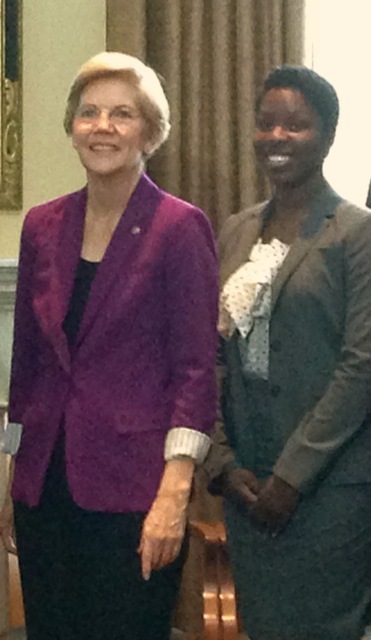 Joke Alesh (D15), chosen to represent TUSDM, was one of a select group of Tufts student leaders who met with US Senator Elizabeth Warren on Monday September 15th. Shortly after the meeting, the Senator took to the stage to speak to a packed auditorium as part of the Tisch College Alan D. Solomon Lecture on Citizenship and Public Service series. Congratulations, Joke! Please join Tufts University School of Medicine and Tisch College of Citizenship and Public Service on October 6th for their 2014 Common Book event, a lecture and discussion by Rishi Manchanda, A97, M03, author of The Upstream Doctors: Medical Innovators Track Sickness to its Source. You can find more information or RSVP for the event over at the Dental Central Events and Volunteer Opps page! The Center at Castle Square, a community center located near Tufts Medical Center, is looking for student volunteers to help out at their afterschool mentorship program. If you are interested in being a mentor, check out the information and flyer below! "The Center at Castle Square is a community center that houses a variety of education, technology, and leadership programs for all ages. We are looking for volunteers to help us run our afterschool youth programs (K2-12) by providing academic support, leading fun enrichment activities, playing games, and being a positive role model and mentor. Our programs have small staff-to-youth ratios and our community culture is tight-knit. Our programs generally run from 4-7 pm every weekday. The Center is at 464 Tremont Street, close to the Arlington T station and the Tufts Medical T station. For more information and to receive a detailed volunteer handout, please contact Nathan Chow at nchow@cstoboston.org or at 617-482-4605 x103." We just got a great photo sent in by the Asian Dental Organization (Formely Asian Dental Student Alliance) from their recent volunteer outing to the Vietnamese Autumn Moon Festival in Dorchester this past week. If you haven't checked out the ADO page, head on over and see what they have to offer! Over the summer, members of the American Association of Women Dentists (AAWD) at Tufts spent a night raising funds and awareness for cancer research through Relay For Life. AAWD member Meera Sahni (D16) summed up her eye-opening experience in a great reflection sent in to Dental Central. "As I walked into clinic the following week, I thought about how easy it is to get wrapped up in the steps that you have to follow. The rapidity at which you can forget the significance of a patient’s medical history on their outlook and mindset when they leave your operatory is astonishing. We are encouraged from day one of our training to “treat the person” but attending Relay for Life has taught me that practicing this philosophy and understanding it are two different things. " Read the rest of Meera's Reflection here! TUSDM’s new web-based portal in support of civic engagement and community service learning is launched! Visit About and find out how Dental Central came into being…Check out Student Organizations and see the depth and breadth of those doing community service work at TUSDM…Or go to Resources and see where to get toothbrushes and supplies for your next event and view the new PHCS online event documentation form — so much easier to use than the old paper forms! But what's really cool is how easy it is to Be in the Know about where and how to get involved in community events. Interested in joining up with Smile Squad later this month at the Oak Street Fair? Or maybe hanging out with Sharewood Clinic in Malden on the 1st and 3rd Tuesday of every month is more of your thing. Or maybe you're looking for something outside of the box, like networking with Vanessa Kirsch and Alan Khazei as part of a Tisch College-sponsored Social Impact Network event. Whatever you're looking for, Dental Central has it all over at the Volunteer Opportunities Page! New Student Organization Pages on Dental Central! Curious about what some of the TUSDM student organizations have to offer? Head over to our Student Organizations page to see the 16 groups that are now up on Dental Central!